Lesley Wellington – Poetry: Geraldine Rose, That’s not where that Goes! The Older Adults category was open to Memoir Workshop participants. Next SWP DEADLINE will be announced in January 2017. Thanks to all who joined us for the 3rd Annual SWP Awards Celebration! 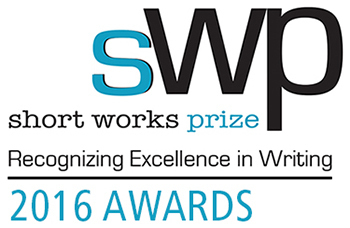 The Short Works Prize for writing is Presented in Partnership by Bryan Prince Bookseller, Hamilton Arts & Letters magazine, and the Hamilton Public Library. 2016 Prize Sponsorships from: the Rotary Club of Hamilton AM, McMaster University, the City of Hamilton Ward 1, Redeemer University College, and Mohawk College. SWP is funded in part by the Hamilton Author Series. 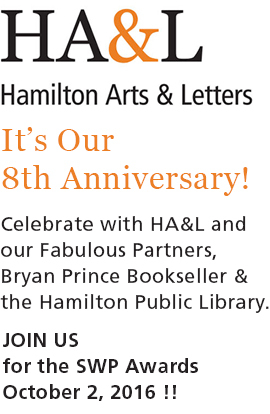 And thanks to HA&L magazine's Community Partner, The Hamilton Spectator.